Frank Parater was first introduced to me by Mother Mary Gertrude Parker of Monte Maria Monastery here in Richmond. In her book Sentinel on the Hill: Monte Maria and One Hundred Years, she describes Frank and the special bond he had with the sisters, his quest for holiness, and his self-offering “oblation” to the Sacred Heart of Jesus. Subsequently, I learned more about Frank Parater when I was assigned to the North American College as a seminarian in 1974. Monsignor Charles A. Kelly, a diocesan priest from Richmond on the staff of the seminary, was enthusiastic in retelling the oral tradition that had been handed down at the college about Frank Parater. He would always recount the story of Frank’s death when he celebrated All Soul’s Day Mass in front of Frank’s niche in the college mausoleum. After my ordination, I heard Monsignor Frank Byrne and Bishop John J. Russell, who were contemporaries of Frank Parater and fellow alumni of the North American College, speak about him with great affection. During the Great Jubilee of 2000, when speaking with Bishop Sullivan, I learned of his desire to advance the cause of Frank Parater and two days later received a letter from him asking me to take the steps that would begin the process for his canonization. Since that time, I have come to know Frank very well indeed. I have learned much about him from his many letters, journals, and documents associated with his life, as well from stories told to me by family members. With the help of archivists, my searches for materials have proven fruitful. The process for canonization is careful and thorough. Currently, the Cause for the Servant of God Frank Parater, Seminarian is in the initial diocesan phase. Under the direction of Bishop Sullivan, a tribunal has been established to examine the cause and heroic virtues of this Servant of God. I see this process as an exercise in communion, since we are a part of the communion of the Saints as we profess in the Creed. At present we are evaluating Frank’s short life here on earth in light of the Gospel. In addition, the witness of heaven is needed. Unto this end, any person may ask for Frank’s intercession in prayer, and if the Lord grants that a miracle, authenticated by the Church, occur, our Servant of God Frank Parater may be given the title “blessed” by our Holy Father. Everyone is invited to pray for the beatification of Frank Parater. May you find the materials presented on these web pages an inspiration and a reminder that all of us are called to holiness! 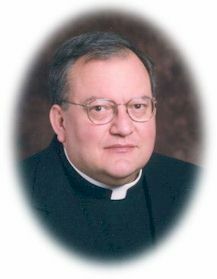 Very Reverend J. Scott Duarte, J.C.D.